The University of Louisiana at Lafayette deployed its emergency response system for the first time today and administrators are pleased with the outcome. The First Call system was activated following the armed robbery of a bank near campus. Alerts were sent out via text messaging along with two phone calls to all campus lines and all cell phones registered with First Call. An initial message was sent to phones following the incident and a second message was distributed after the suspect had been arrested. An alert message was also recorded on the campus hotline and the university’s homepage changed to a text-only site that replaced the usual homepage. Students who have not signed up for First Call are encouraged to do so free of charge. Each student has the opportunity to provide additional email addresses and phone numbers. For instance, a student may choose to include their parents’ home phone number as an additional contact number. The First Call service is part of an initiative by the Louisiana Board of Regents and supported by the University of Louisiana System. The University of Louisiana at Lafayette is the second largest university in the state, with over 16,000 students. A public institution, it awards bachelor's, master's and doctoral degrees. 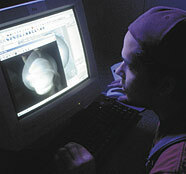 It includes diverse offerings from the humanities to scientific research and is a national leader in areas like computer science, biology and nursing. Its student-athletes - Louisiana's Ragin' Cajuns - compete in NCAA Division I, the highest level of collegiate competition.